Littondale is the dale of the River Skirfare and the villages of Hawswick, Arncliffe, Litton, Foxup and Halton Gill. Littondale lying deep within the Yorkshires National Park and located to the west of Wharfedale is a peaceful and tranquil dale as the world passes by the end of the valley on the B6160, Skipton – Kettlewell road. This beautiful dale with its dry stone walled fields and rich green steep hillsides of open pasture and hanging woods, crested by craggy outcrops and exposed moorland is dotted with stone barns, some 17th century farmhouses and a number of shake holes and sink holes that lead to underground cave systems. 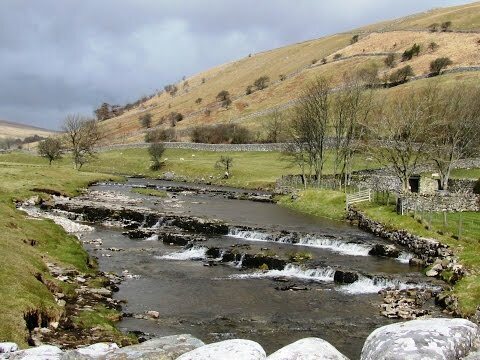 The River Skirfare flows through Littondale for 9.5 miles from the confluence of Foxup Beck and Cosh Beck into the River Wharfe between Kettlewell and Conistone. At the head of the dale is Pen-y-ghent one of the Yorkshire Dales Three Peaks and the area is popular with walkers, cyclists, anglers, photographers, artists and those just wanting to get away from it all. On Sunday 19th May 2013 the Etapes du Dales, a 112 mile extremely difficult cycle ride starting and finishing in Threshfield near Grassington, with just under 1000 cyclists travelling through the Yorkshires Dales which includes Littondale. Litton with its tiny village green is the third hamlet in the dale its name meaning village on a roaring stream. The Queens Arms is a 17th century inn, refurbished in 2012, is now under local ownership and is proud to have a locally sourced dales team managing the pub. The pub offers real ales, home cooked local food and accommodation. Halton Gill, the dales fourth hamlet, its name derived from the Anglo Saxon “haugh” meaning Valley and “tun” meaning farm and gill an old Norse word meaning “ravine” therefore meaning “valley farm by the ravine”. Halton Gill Bunk Barn is traditional stone barn converted into high quality accommodation by the Cowan family who have farmed here for 150 years. The Bunk Barn sleeps 40 people in eight separate bedrooms. Feeling thirsty then why not call into Katies Cuppas for a lovely cup of tea. The 2010 Sainsbury’s Christmas advert was filmed in Halton Gill and was also the location for the filming of 2012 film The Woman in Black. The last hamlet in the dale is Foxup, meaning upstream with the foxes, and until recently the hamlet had three farms but only one remains. Foxup is the end of the main road through Littondale and it is also the source of the River Skirfare. The sunny hamlet of Hawkswick is the first of the settlements in the dale. The name derived from the Middle English, Hauk meaning someone who trained Hawks and wick meaning dairy farm. The long narrow ridges in the hillside above the village were formed by medieval ploughs called lynchets. Oats were grown and oatcake and porridge was eaten throughout the dale because wheat cannot stand in the summer rain. The village used to have a ballroom in a barn and is now a house still called The Ballroom. The second hamlet is Arncliffe which lies at the confluence of Cowside Beck and the River Skirfare. It is the largest village in the dale its name derived from the Old English “earna-clif” meaning eagle’s cliff. The village, a conservation area, and its only pub are centred round its large village green where the yearly Fete is held. Behind the buildings are some small crofts, nearly one to each house and the lime stone walls beyond cover the hillsides like a patchwork quilt. The Falcon Inn, with accommodation, still serves its beer in the old fashion way from barrel to glass via a porcelain jug. Evening meals and breakfast are traditional home cooking and plenty of it. The Falcon also has four miles of its own private fly fishing on the River Skirfare. The lovely church of St. Oswald’s, situated by the River Skirfare, was built in the 16th and 18th centuries replacing the first stone church built in the 12th century. Arncliffe was the original setting for the fictional village of Beckindale in the TV soap Emmerdale Farm from 1972 until the relocation to Esholt and the Falcon Inn was featured in the soap as the Woolpack Inn. We park at the side of the road near the Queens Arms and walk forwards into the village, cross over a little bridge and after passing the telephone box turn left at the bridle path sign down to the River Skirfare. We cross over the bridge and head forwards slightly to the right over the field to go through a gate and head towards the right of the buildings. We cross the stile in the wall using the steps and turn right onto a track. We follow the track till we see a bridge on the right but we head forwards through the gate then turn right at the footpath sign for Nether Hesleden and head forwards over the fields to Hesleden Beck. We follow the beck on our right for a short way then cross over the bridge on the right to Nether Hesleden. We turn left at the footpath sign to Foxup then slightly right to go over the stile on the left. We follow the footpath sign with the River Skirefare down below through the fields using the gates and the stiles until we come to a road. We cross straight over the road, Halton Gill is to our right, and follow the river until we come to the bridge at Foxup. We turn left through the tiny hamlet with the beck on our right to the end of the road. We turn right over the bridge and immediately left with the beck on our left. We walk up to the track to the buildings and head straight forward through the gate at the signpost to Cosh and then head across the fields on the path using the stiles and the gates. After passing a number of stone barns we go through a gated stile into an open area of rough ground and make our way down to Cosh Beck and the waterfall. We then cross the beck at a safe point and clamber up the bank to a track. We now follow the track back to Foxup. On reaching Foxup we turn left and follow the small narrow road with the River Skirfare on our right. We pass through Halton Gill and keep heading forward following the road back to Litton. This is a moderate walk through fields and over rough ground to the waterfall and returning on a good track and a small single track road. Elevation: Lowest point approx 248 m (813 ft), highest point approx 402 m (1320 ft). Approx 8.5 miles allow 3 hours 30 minutes using OS map OL30 Yorkshire Dales Northern and Central areas. Wensleydale, Swaledale. Start Point: The Queens Arms at Litton. Litton is in the dale of Littondale within the Yorkshire Dales National Park. From the A1 take the A61 to Ripon. At Ripon take the B6265 through Risplith and Pateley Bridge, past Hebden and Grassington. At the t-junction at Threshfield turn right onto the B6160. Pass-by Conistone and through Kilnsey and take the next left for Arncliffe. On reaching Arncliffe turn right and follow the narrow road round to go over the bridge and at the t-junction turn left and follow the road to Litton. Road side parking only. There are no public toilets the nearest ones are at Kettlewell and Grassington. For refreshments there is a pub the Queens Arms at Litton and Katies Cuppas at Halton Gill. The next nearest pub is the Falcon Inn at Arncliffe. There are two pubs, tearoom and shop in nearby Kettlewell and many shops, cafes and pubs in Grassington.